A number of people who were involved in the recovery effort in the weeks after 9/11 have said they saw or helped recover objects at the World Trade Center site that appeared to be black boxes from a plane. One worker unearthed an object that looked like a black box at Pier 25 on the Hudson River. FBI agents who inspected the object initially said enthusiastically that it appeared to be a black box, but subsequently said they didn't think it was one of these devices. A firefighter has described helping FBI agents retrieve three black boxes at Ground Zero and a colleague of his recalled seeing one of these being recovered. Additionally, investigators reportedly detected a signal that was being emitted by one of the black boxes from Flight 11 or Flight 175 and recovery workers were sent to search in the location where the signal was coming from. One government official actually said off the record that all four black boxes from Flight 11 and Flight 175 were recovered. This was certainly a reasonable assertion. It would in fact have been unusual if the devices were never found, since a plane's black boxes are made to survive extreme conditions, and so the black boxes on Flights 11 and 175 should have withstood the conditions they endured on September 11. Furthermore, experts have said they knew of no plane crashes, other than those at the World Trade Center, after which the black boxes weren't recovered. Indeed, the black boxes from the two other planes that were hijacked on September 11--American Airlines Flight 77 and United Airlines Flight 93--were recovered within a few days of the 9/11 attacks. If the accounts of the black boxes from Flights 11 and 175 being found are correct, we need to consider why the discoveries went unreported. And why has it been officially claimed that no black boxes were found at the World Trade Center site? Might it be because the information on the black boxes is inconsistent with the official account of the 9/11 attacks? Perhaps it indicates that rogue individuals in the U.S. government and military were involved in planning and carrying out the attacks. So in order to maintain the official account of 9/11, it has been necessary to prevent the information on the black boxes being made public. The black boxes from the planes that were hijacked on September 11 could have provided investigators with invaluable information about these flights. At Ground Zero, finding the black boxes from Flights 11 and 175 was therefore considered a priority in the initial days of the recovery operation. 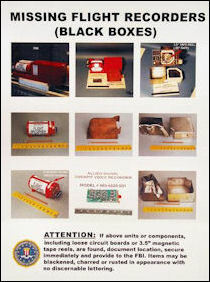 Numerous posters showing what a plane's black boxes look like were put up around the World Trade Center site so people would recognize the devices if they came across one as they searched through the debris. The accounts below strongly suggest that recovery workers did indeed find some or all of the black boxes from Flights 11 and 175. On October 12, 2001, an operating engineer unearthed what appeared to be a black box from a plane while he was scraping up a load of debris at Pier 25 on the Hudson River. At Pier 25, a short distance from the World Trade Center site, debris was being loaded onto barges and then transported to the Fresh Kills landfill on Staten Island. The operating engineer thought the object was the same shape as a black box. It was too badly burned and blackened, though, for him to tell if it had originally been bright orange, the color of a plane's black boxes. The crane operator at the pier inspected the object and he too thought it looked like a black box. The operating engineer made a call to report the discovery and got through to Lieutenant Ed Moss of the Port Authority Police Department (PAPD). In response to the call, Moss and his colleague, Lieutenant Bill Doubrawski, went to the pier and examined the object. Both men thought it appeared to be one of the black boxes. Excited at the discovery, Moss contacted Lieutenant William Keegan, who was in charge of the PAPD's nighttime rescue and recovery operation at Ground Zero, told him what had happened, and described the object that had been unearthed. Wanting to examine the object for himself, Keegan went to Pier 25. After comparing the object to some photos of the black boxes from a plane, Keegan agreed with his colleagues' assessment. He has recalled that he determined the object "was absolutely close enough to the pictures available to us to notify the FBI without delay." The PAPD officers promptly requested that some FBI agents working at Ground Zero meet them at the PAPD command post, in front of the Borough of Manhattan Community College. Twenty to 30 minutes later, two FBI agents arrived at the command post. They inspected the object and compared it to a diagram of a black box. Like the other people who examined it, they appear to have thought it was one of the black boxes from Flight 11 or Flight 175. They said words to the effect of "Wow, this looks like it!" and "It's the same shape!" according to Keegan. And yet for no obvious reason, after examining the object for a few more minutes, they apparently changed their opinion. They told the PAPD officers, "We don't think it's a black box." Recovery workers searched for one of the black boxes from Flight 11 or Flight 175 after a signal thought to have been coming from the device was detected in the week after 9/11. Recovery workers searched for the black box in locations where the Federal Aviation Administration (FAA)--the government agency that is responsible for operating the U.S. air traffic control system--told them the signal had been detected. FAA personnel initially said they thought the signal was coming from the corner of Liberty and Church Streets, which bordered the south and east edges of the World Trade Center site. Recovery workers were therefore sent to dig at this location. But a few days later, the FAA decided the signal originated from a different location. On Friday, September 21, it said the signal was coming from inside or directly below the roof of Building 5 of the World Trade Center. This building was in the northeast corner of the World Trade Center site, a significant distance from where the FAA previously said the signal originated. Three officers with the New York City Police Department's Emergency Service Unit (ESU) were sent to search the roof of Building 5. Once they made it up there, the officers looked around for a hole or a dent that would have been created if a black box had impacted the roof after being catapulted out of one of the planes that crashed into the World Trade Center. However, they found the roof to be intact, with no signs of any objects landing on it. One of the ESU officers, Steven Stefanakos, repeatedly tried contacting the FAA employee(s) responsible for finding the black boxes at Ground Zero, to request more details about the location of the black box, but received no response. Eventually, a voice came over his radio and told him: "The FAA aren't here. They went home for the weekend." Since it was only around five o'clock in the afternoon, Stefanakos and his two colleagues were astonished that the FAA employee(s) had left work early at such a critical time, when it was possible that one of the black boxes was about to be found. The three ESU officers then abandoned their search for the day. Whether a black box was later found and retrieved from Building 5 is unknown. Mike Bellone, a volunteer recovery worker at Ground Zero, supported DeMasi's account. He said he personally witnessed one of the black boxes being recovered. He recalled that around late September or early October 2001, he saw DeMasi escorting "these FBI agents into the area" to search for the black boxes. "They had found one [of the black boxes] that I know of, that I actually physically saw," he said. He described this object as "a box that appeared charred but was reddish-orange with two white stripes"--a description that fits a plane's black box. A government official stated that in fact all four black boxes from Flights 11 and 175 were found at the World Trade Center site. Despite the evidence described above, which indicates that black boxes from Flights 11 and 175 were recovered in the weeks after 9/11, U.S. government officials have claimed that none of the black boxes from the planes that crashed into the World Trade Center were found. FBI spokesman Stephen Kodak stated: "To the best of my knowledge, the flight recording devices from the World Trade Center crashes were never recovered. At least we never had them." And Jim Margolin, a spokesman for the FBI's New York office, said, after checking with the leader of the bureau's Ground Zero investigation, that no black boxes were recovered from the wreckage of the World Trade Center. Furthermore, the black boxes on the planes that were hijacked on September 11 were modern solid-state models, which are more resistant to damage than older magnetic tape recorders. The black boxes from Flights 11 and 175 should therefore have survived the crashes on September 11 and the collapses of the World Trade Center towers. If the black boxes from Flights 11 and 175 were recovered, we need to consider why the discoveries went unreported when they occurred and authorities have, in the years since 9/11, claimed that no black boxes were found at the World Trade Center site. And yet this behavior appears to make no sense. Dave Lindorff commented: "Why would the main intelligence and law enforcement arm of the U.S. government want to hide from the public not just the available information about the two hijacked flights that provided the motivation and justification for the nation's 'war on terror,' and for its two wars against Afghanistan and Iraq, but even the fact that it has the devices which could contain that information?" In other words, why would the government suppress information that should have strengthened its case for fighting the "war on terror"? The accounts of people who said they recovered black boxes at the World Trade Center site or were told that a signal from a black box had been detected at the site give rise to a lot of questions. Why, for example, did FBI agents say the object found at Pier 25 wasn't a black box, especially considering that they initially said it appeared to be a black box and they had no obvious reason to change their assessment? And if the agents genuinely believed the object wasn't a black box, why did they prevent William Keegan from throwing it onto a barge to be transported to the Fresh Kills landfill and instead take it away with them? A possible explanation for their behavior is that they did indeed think the object was a black box, but they had been told that if any of the black boxes were found, the discovery had to be kept quiet. Also, why did the FAA say on September 21, 2001, that a signal from a plane's black box was coming from World Trade Center Building 5 when it previously said the signal was coming from the corner of Liberty and Church Streets, a significant distance away from Building 5? Could the agency really have made such a major error about where the signal was coming from? And why did the FAA employee(s) responsible for finding the black boxes at Ground Zero leave work so early that day? Surely they would have wanted to be available to assist the recovery workers who were searching for a black box in the new location, especially since the workers may have been on the verge of retrieving one of the crucial devices. Furthermore, why was it reported on September 25, 2001, that the FAA had been unable to detect a signal from a black box at Ground Zero, even though the agency previously told recovery workers the locations where a signal had been detected? Might it be because, by that time, the black box that emitted the signal had been recovered, but FAA personnel had been instructed to cover this fact up and act as if no black boxes had been found? If the black boxes from Flights 11 and 175 were found, a possible reason why this fact has been concealed is that the information on the devices is inconsistent with what is supposed to have happened on September 11, according to the official account of the 9/11 attacks. But if this is the reason, why were the discoveries of the black boxes from the two other planes that were hijacked on September 11--Flights 77 and 93--openly reported and never officially denied, when the information on these devices might also be inconsistent with the official account of the attacks? A possible explanation is that the people who planned the 9/11 attacks would ideally have liked to have claimed, after September 11, that none of the black boxes from the four hijacked planes were retrieved, since the information stored on the devices could, if made public, lead some people to question the official account of the attacks. They determined, however, that it would appear incredible and suspicious if it was claimed that no black boxes were found at the Pentagon and in Shanksville. At these crash sites, the devices would endure less severe conditions than would occur at the World Trade Center. The planners of the attacks could have decided they would at least be able to get away with claiming that no black boxes were found in the rubble of the World Trade Center, since the loss of the black boxes from Flights 11 and 175 would seem plausible, at least to the average member of the public. Considering the massive destruction that would occur when the World Trade Center towers collapsed and the huge amount of debris that would be created, they assumed it could be convincingly suggested that the black boxes were destroyed or lost. If there has indeed been a concerted effort to conceal details about the information stored on the black boxes from Flights 77 and 93, a possible reason for the cover-up is that the information is inconsistent with the official account of the 9/11 attacks and so, if it was made public, this could lead people to question that account. In light of the contradictions between the accounts of black boxes being recovered at the World Trade Center site and the official claim that no black boxes were found at the site, there is clearly a need to investigate what happened to the black boxes from Flight 11 and Flight 175 more closely. If these devices were indeed recovered, we need to know what information is stored on them. Dave Lindorff was told by his source at the NTSB, "We worked on them [the black boxes from Flights 11 and 175] here." If this is true, the NTSB presumably has records of what information is on the black boxes, which could be released to the public. The information on the devices would surely give us a better understanding of what happened on September 11, 2001. And it might indicate that the truth about the terrorist attacks that day is very different from what we were led to believe. "The Tech Behind Black Boxes." TechTV, September 14, 2001; Brian Dakss, "Speed Likely Factor in WTC Collapse." CBS News, February 25, 2002; "Anatomy of a Jetliner." PBS, February 17, 2004. Jon Hilkevitch, "Flight Recorders Could Answer Key Questions." Chicago Tribune, September 14, 2001; "The Tech Behind Black Boxes"; "FBI Analyzing Voice, Data Recorders From Two Flights." Associated Press, September 15, 2001; "Anatomy of a Jetliner." William Keegan Jr. with Bart Davis, Closure: The Untold Story of the Ground Zero Recovery Mission. New York: Touchstone, 2006, p. 94. Richard T. Pienciak, "Anguished Search for Traces of the Missing." New York Daily News, January 6, 2002. William Keegan Jr. with Bart Davis, Closure, pp. 94-96. "World Trade Center Plane Crash." New York State Emergency Management Office, September 18, 2001, p. 1. Susan Sachs, "At the Site, Little Hope of Uncovering Survivors." New York Times, September 19, 2001. Anthea Appel, The First Responders: The Untold Story of the New York City Police Department & September 11th, 2001. InnerCircle Publishing, 2009, pp. 281-282. "Situation Report #27." New York City Office of Emergency Management, September 25, 2001, pp. 17-18. Paul J. Kern, "AMC: Accelerating the Pace of Transformation." Army Magazine, February 2002; Dan Caterinicchia, "Lessons Worth Remembering." FCW, September 16, 2002. Gail Swanson, Behind the Scenes, Ground Zero, World Trade Center, September 11, 2001: A Collection of Personal Accounts. New York: TRAC Team, 2003, p. 108. Will Bunch, "9/11 'Black Box' Cover-Up at Ground Zero?" Philadelphia Daily News, October 28, 2004; "9/11." Conspiracy Theory With Jesse Ventura, truTV, December 9, 2009. Will Bunch, "9/11 'Black Box' Cover-Up at Ground Zero? "; Dave Lindorff, "9/11: Missing Black Boxes in World Trade Center Attacks Found by Firefighters, Analyzed by NTSB, Concealed by FBI." CounterPunch, December 19, 2005. 9/11 Commission, The 9/11 Commission Report: Final Report of the National Commission on Terrorist Attacks Upon the United States. New York: W. W. Norton & Company, 2004, p. 456. "The Tech Behind Black Boxes"; "Setback Over Pittsburgh Black Box." BBC News, September 15, 2001. Jon Hilkevitch, "Flight Recorders Could Answer Key Questions." Brian Dakss, "Speed Likely Factor in WTC Collapse." "Personal Record of Dale L. Leppard." Experts.com, n.d.; "Dale L. Leppard (Leppard Forensic Reconstruction)." JurisPro, n.d.
 "'Black Boxes' Found at Pentagon." Washington Times, September 14, 2001; Matthew P. Smith, "Flight 93 Voice Recorder Found in Somerset County Crash Site." Pittsburgh Post-Gazette, September 15, 2001. Dave Lindorff, "9/11: Missing Black Boxes in World Trade Center Attacks Found by Firefighters, Analyzed by NTSB, Concealed by FBI." Anthea Appel, The First Responders, p. 282. Brian Dakss, "Speed Likely Factor in WTC Collapse"; 9/11 Commission, The 9/11 Commission Report, p. 456. "Feds Would Have Shot Down Pa. Jet." CBS News, September 12, 2001. Phil Hirschkorn, "On Tape, Passengers Heard Trying to Retake Cockpit." CNN, April 13, 2006; Neil A. Lewis, "Final Struggles on 9/11 Plane Fill Courtroom." New York Times, April 13, 2006.
was Dan Rather announcing: "Video now of New York Mayor Rudolph Giuliani holding up what he says is one of the flight recorder black boxes recovered from the debris around the World Trade Center. If this turns out to be er... the case, er... this is a big breakthrough for investigators. (Pause) I'm told we have a technical problem with video tape... ah, can't play it for you just yet, but this would be, if not a bulletin of the hour, certainly a... er... urgent on anybody's news wire, that er.. Mayor Giuliani says er... and holds up what he says is one of the flight recorder boxes. We'll be trying to show you that video shortly." So, an object, believed to be a flight recorder, was found and presented as such to the New York Mayor (one assumes he didn't dig it up himself) and a video was made of him holding it up. Was any explanation offered subsequently or was the video quietly 'forgotten about'? Cognito on Sun, 09/11/2016 - 3:25pm. express my appreciation for your continued hard work in putting out such articles as this. I will read it tomorrow morning (nearly midnight here at the moment!). And as I grew up in the UK in the 80s, I'm one of the (probably few) people here on 9/11 blogger that actually remembers the TV show, 'Shoestring' . . . it had great theme music! Platos Cave on Tue, 09/13/2016 - 6:41am. Thanks so much Shoestring. I am behind on my reading too. TomT on Tue, 09/13/2016 - 8:18am. Thanks Platos Cave and TomT! I hope you enjoy reading the article. I find some of the evidence that I included in this article particularly compelling. Among other things, some of the accounts I describe clearly seem to show that there was an official cover-up of important evidence about what really happened on 9/11. Shoestring on Tue, 09/13/2016 - 9:08am.